From the moment you pick up a bottle of Jérémie Mourat’s Moulin Blanc you sense that this is going to be something a little different. The heavily wax-sealed bottles are unusual but not unique, but then to see ‘Blanc de Blanc’ and ‘Blanc de Noirs’ labels on still white wines adds to the suspicion that something singular is going on here. And you’d be right. Jérémie comes from a family of wine merchants, trading in wine and more recently in their history, making it too. Based in the village of Mareuil sur Lay in the Atlantic-influenced Vendée, south of the vineyards of Muscadet in the western Loire, the cellars produce four different labels, including the selection tasted here from an estate called Moulin Blanc. The Moulin Blanc property is based around an ancient windmill. Until recently a ruin, the windmill has been meticulously restored by Jérémie and now its sails turn majestically above the 15 hectare site in the valleys of the Lay and the Yon. Having purchased the property two years ago, Jérémie has also overseen a total restoration of the vineyards which had stood neglected for years. The vines are over 40 years old, and are mostly Pinot Noir. Their hillside position enjoys breezes from the Atlantic only 20 kilometres away. The operation is in conversion to organic farming and no chemicals or herbicides are used. The Vendée, a large but relatively unglamorous region wine-wise, but Jérémie is cited as one of the driving forces that is propelling the region if not into the spotlight, then certainly out of the gloom. In tasting it seems clear that he has been influenced in part at least by the early precursors of the natural wine movement and producers like Josko Gravner in Friuli. He is making some superb wines with very hands-off techniques and the now familiar natural wine traits of organic farming, natural yeast fermentations and vinification that eschews small barrels in favour of big, old casks and a variety of nouveau concrete tanks and ‘eggs’. As well as Pinot Noir there is Chenin Blanc and Chardonnay on the property, and currently the Moulin Blanc ranges consists of that pair of white wines – the Blanc de Blanc made from Chenin and Chardonnay and the Blanc de Noirs made from Pinot Noir – the latter also being responsible for the Moulin Blanc rosé and red wines. All of the wines are classified as IGT Val de Loire, though the labels also carry the legend ‘Loire Meridionale’, or ‘Southern Loire’. 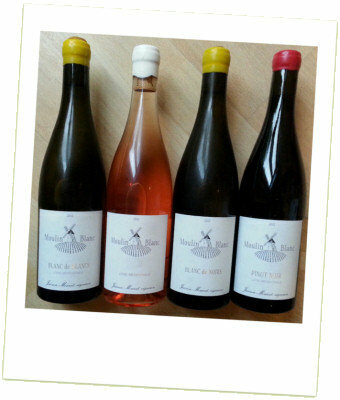 Jérémie Mourat’s wines are imported and sold by Ten Acre Wines Ltd. This 13.5% alcohol white from white grapes is composed of 65% Chenin Blanc and 35% Chardonnay, A golden hint to the pale green colour. Really inviting, gently yeasty and salty nose, with a burgeoning sense of honey and almond richness amongst the fresh, ozone and apple aromas. Just delicious on the palate: massively tangy and vital, a core of apple cut by a squeeze of ripe lemon or orange maybe, the dry, nut husk quality hinting at a Fino Sherry without any sense of the oxidation. It’s the delicious core of sweet fruit that pushes through, nutty notes gathering again in the very long finish. Superb. 93/100. Made from 100% Pinot Noir, this has a slightly less golden, more emerald-tinged colour, and immediately haunting rose-hip nuances to the aroma. Made entirely in the concrete ‘eggs’ with no oak contact, the wine has a gently mineral, yeast and dry apple core coolness. Whilst not doing so quite as dramatically as the Blanc de Blancs, the palate bursts into life with the sweet ripeness of the fruit, but there is more restraint, more tight, mineral character and precise acidity here making it a little less fleshy, a little less outgoing, but giving a huge feeling of energy and pin-point accuracy in the finish. 91/100. Sadly now sold out, importer Ten Acre Wines is awaiting the next vintage being shipped. This is 100% Pinot Noir from 30-year-old vines planted in clay on a bed of slate. Fermented in concrete tank, like the white wines it spends six months on the lees. Palish, salmon/peach colour and very attractive and delicate nose. There’s that little note of salts again, tiny dried herb and flower notes, and then racy, fine raspberry and redcurrant fruit. On the palate really zippy and fresh, a lovely thrust of acidity and that tangy saline minerality to offset the fruit. Really vital, energized stuff with a long lightly nutty finish. 91/100. This wine from 40-year-old vines is made in large oak vats of 6,800 litres (around 30 times bigger than Bordeaux or Burgundy barriques). It has a really distinctive nose, with a lifted cherry and blossom character, a really delicate spice and herb fragrance, the black cherry bringing the fruity notes but all sorts of cool, quite Beaujolais-like nuances too. On the palate it has a lovely rolling, medium-bodied texture thanks to a silkiness to the tannins and the sweet black fruit balance of the wine. The quality in the mouth reflects the aromas, mingling spiced cherry compote with a little clove and briary, brackeny, herbal quality, a nice bit of weight mostly from the full alcohol (13.5%) but that little chocolaty rounding of its time in wood perhaps. But once again this is a wine all about freshness and energy into a finish laced with fruit spice. 90-91/100.